Another project is complete – making it two projects in the first month of the new year (outdoor tool shed was the first). I’m showing before and after pictures which just makes me cringe but if I don’t show them, you won’t value the true transformation! 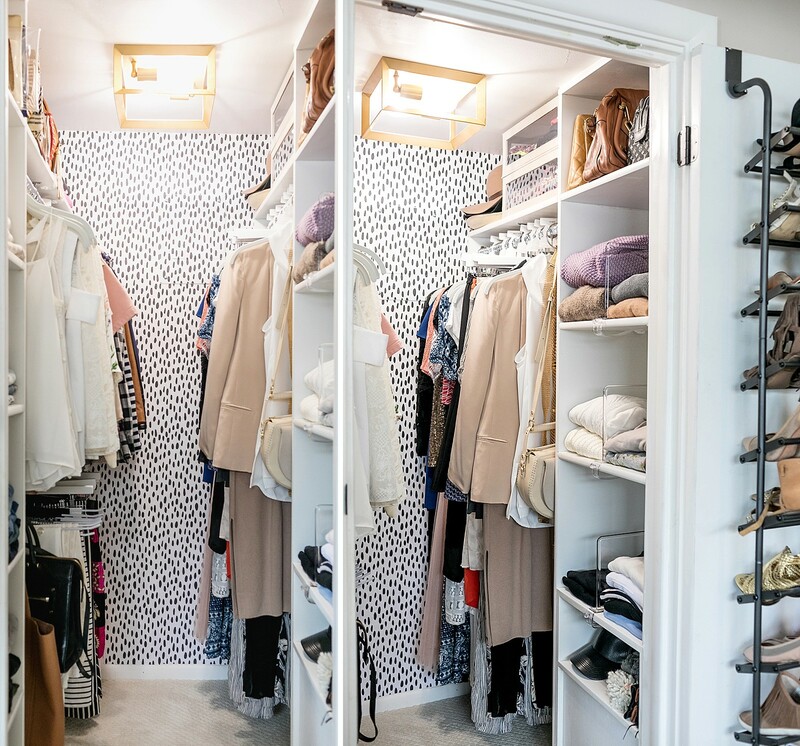 A big thanks to my friend Danielle Wurth of Wurth Organizing, a professional organizer and an incredible problem solver with all types of spaces! She came over to help figure out a way to make my very small closet (4.5 feet wide and only 5 feet deep) efficient. The ceiling is just shy of 7 feet. Oh it pains me to put before photos on this blog but I know it’s necessary – you can tell I kinda gave up trying to make the insides look nice since it just wasn’t ever going to happen the way it was. I have an electric panel in my closet, boo! I would have preferred it be installed behind the clothes, but I guess back then no one cared about how a closet looked. There were shelving built-ins on the left side, and on the right I bought a cheap show organizer to add more storage. I attempted to make another shelf up top with using shelf dividers and tossed a board up there. My clothing on the double hang bars touched the bar below which drove me nuts, and some of my skirts were hitting the ground – everything was too low – 1952 home you know, tiny people. Danielle suggested after removing everything, to build up the built-ins to the ceiling. That way, the closet while small, will look taller. The top ledge would be 12″ down from the ceiling, just enough space for clothing. We also had room behind the hangers to move them a few inches closer to the wall – so I could actually walk in and not feel smoothed. Danielle came over with storage closet ideas in hand and presented me with a sketch, so detailed that I could just give it to my handyman to follow the instructions. She also helped walk me through donating and moving my items around – sometimes you need someone who is just real with you on your items. Always trust your designer/organizer! They are the professionals. I swapped my black velvet hangers to off white ones (here are some on Amazon), and gave them to my newly married friend who just bought a house. The swap made a huge difference in lighting up the space. I even swapped out the pant hangers and skirt hangers, because it all need to be white! The chrome rods I’ve had my eyes on since I toured homes and loved their sleekness. Hangers also slide on it so easily it reminded me of a boutique. We moved the rods closer to the wall so I could gain a few inches of walk in room. I also bought these purse hooks to remind myself to use these totes more often. The ones not often used are still in dust bags and a few daily totes and bags – about four of them – are hanging in my office behind the door. I insist garment organizers help with your organization and you should consider them. The label I created include: jackets, blazers, skirts, tunics, formal, jumpsuits, dress pants, and resort dividers. 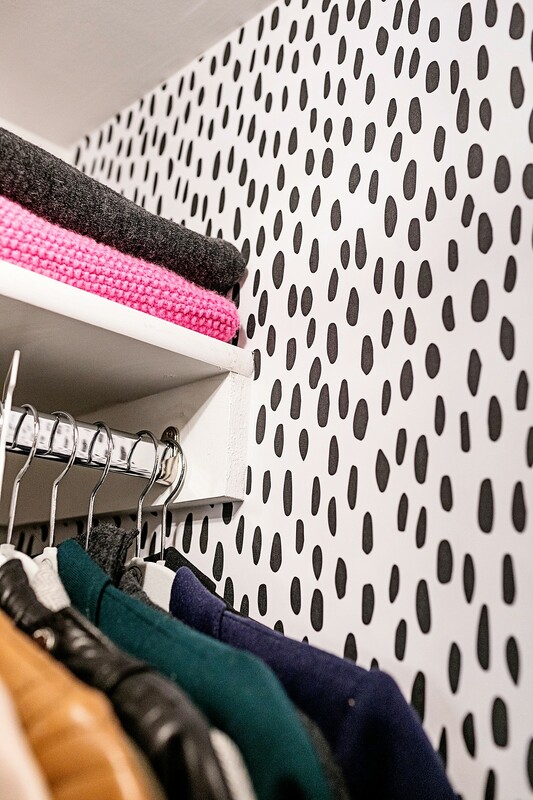 Your friends will make fun of you, but when you ask them how it’s working for them with closet organization, you can give a sly little wink. It helps when you just need to find something quickly and helps you assess how much of that type you have. It is also incredibly helpful when your husband is doing laundry – he knows where things go! We moved the lighting to the center – because it makes more sense. I had an electrician install a light switch and move the light and mount this pretty gold flush mount fixture from Home Depot. It comes with bulbs but they are really yellow and get hot – buy these LED Edison bulbs on Amazon in 4000k for a bright pure white. Just a note – they are SOOOOO bright so you can put it on a dimmer if you prefer, these light are dimmable. After we installed them I walked around the house and thought every room was dim, even my computer screen, LOL! 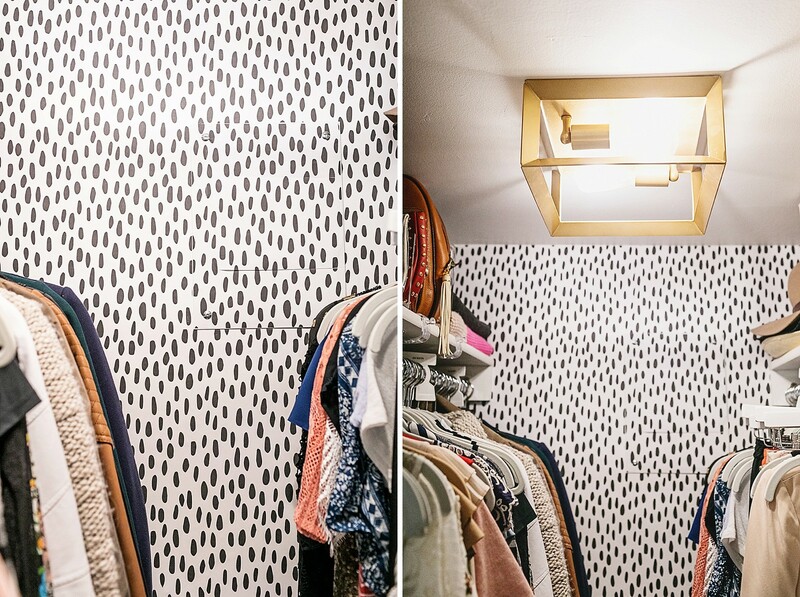 I’ve been wanting spotted walls for a while, I just fell in love with the trend. 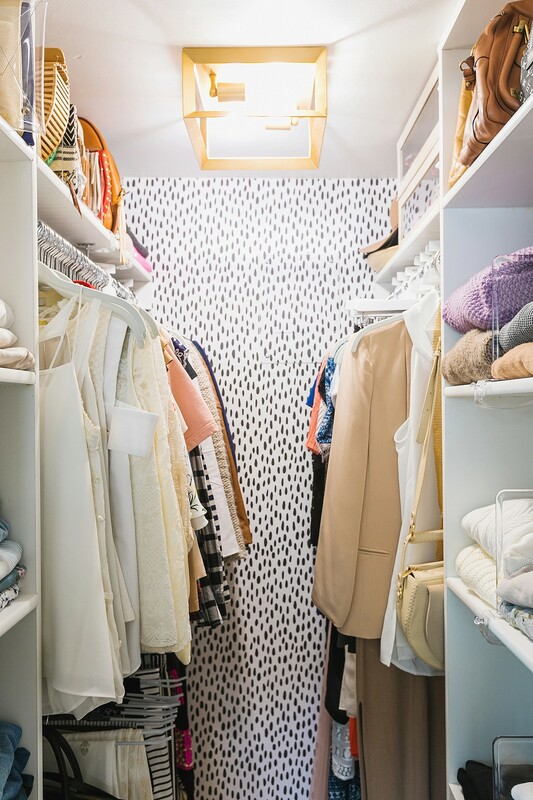 We considered painting the back wall a black and white spot pattern to save money, but the more I thought about the day in the future when this closet would become Benjamin’s, the more I didn’t want to think about repainting the back wall – just think of the priming and painting hours! So I searched for removable wallpaper on Etsy and found Livettes and her removable wallpaper – you can also get old fashioned wallpaper if you’re a fan. 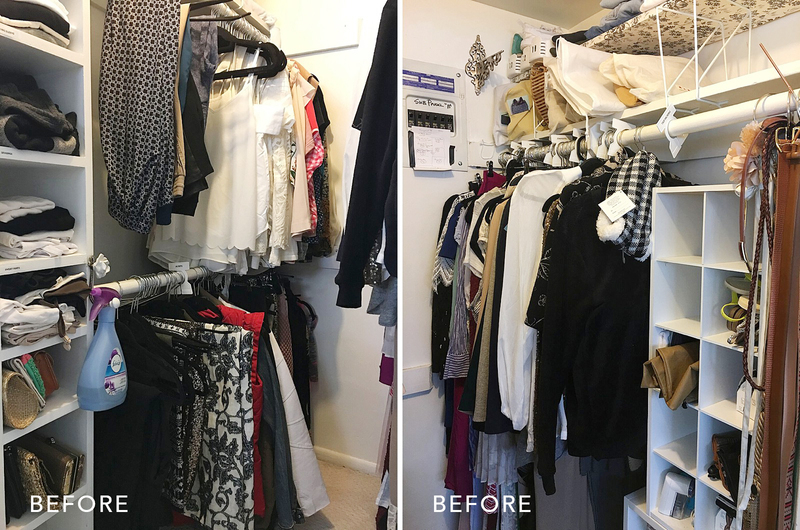 It was so easy and I highly recommend measuring your closet, then cutting around shelving and then installing it – it’s seamless and ridiculously easy. ^^ You can’t tell much, but we just wallpapered over the panel – it was just the best solution – there’s clever access to it. I go nuts over acrylic. Sometimes I think I’d be OK living in an acrylic house – with an AC on blast of course, ha! I just enjoy the airiness it brings to spaces, tiny spaces especially. 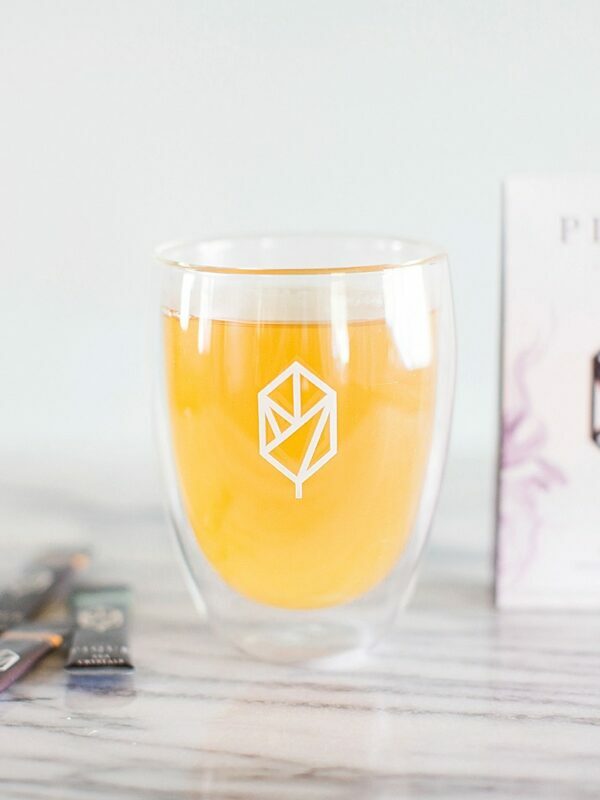 Danielle recommended these clear shelf dividers and they are only $9.99. I also like these at Target. The drop down boxes were great ideas – but my shelving was only 12.5″ deep and so the ones at The Container Store which were 15″ deep wouldn’t work for me. So I found these on Wayfair (since sold out, but check back and found here on Amazon). They were perfect! I like that I can just open the lid without taking a box down to open the top – and I can see in them. This houses off season stuff or things I don’t reach for as often – swimsuits, scarves and athletic clothes overflow. This over the door shoe rack that holds 36 pairs comes in handy but those are not all my shoes – the other half are in the laundry/mudroom. 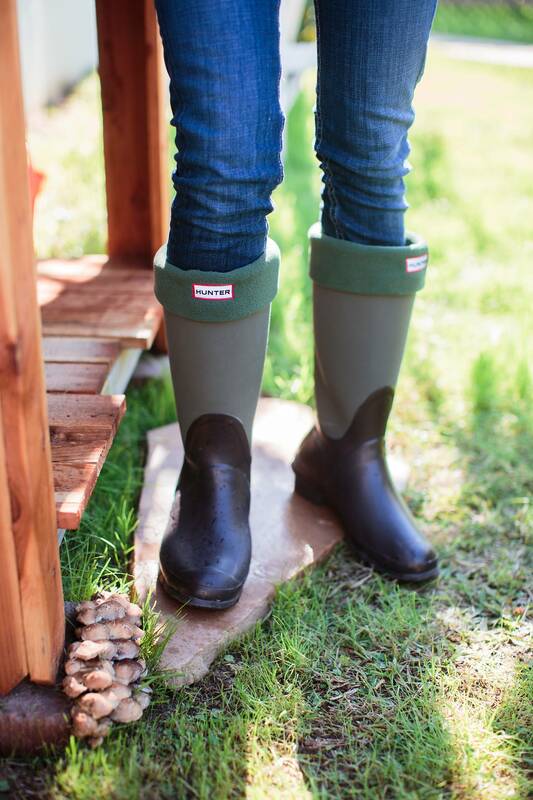 One day all my coats and shoes will be in the same closet, but until then, this works for some of it. My things are still spread around the house but it would be impossible to put it all in this very small closet. I only have a single small tub under my bed that has my summer clothing but I think I probably could fit it all in here if I tried. We took everything out and built it back up – which I thought was a good idea to have a clean slate. 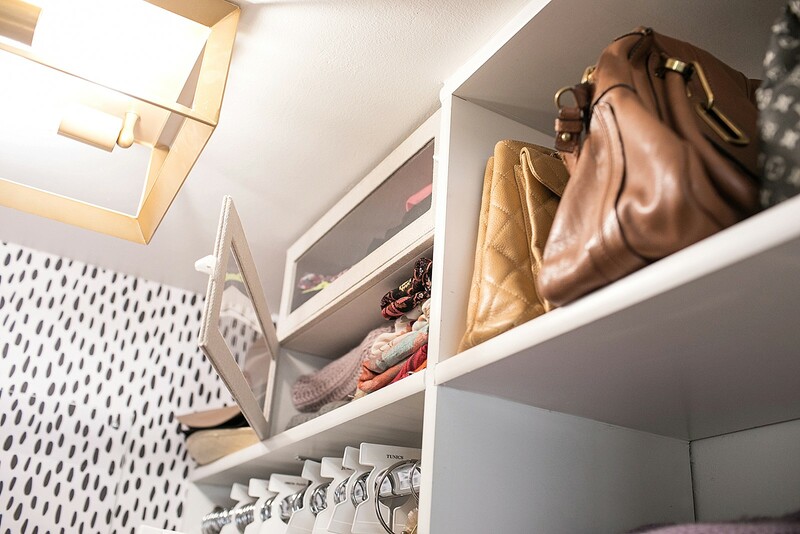 Having the shelving go all the way to the top of the small barely 7′ closet and moving the shelving up was great – 12″ height for the top shelf is more than enough to still fit baskets and clothing up there with dividers. The only thing I’m considering adding is an acrylic door for the top shelf so I can take my designer bags out of their dust bags and display them properly. That, I can do myself later down the line. The $500 budget I had went out the window, no surprise there with home renovations, right? Always takes longer and always over budget. I also think that I forgot the extras I’d want – like replacing all my hangers and upgrading the lights. The total wasn’t horrific but I think I had unrealistic expectations when I started. 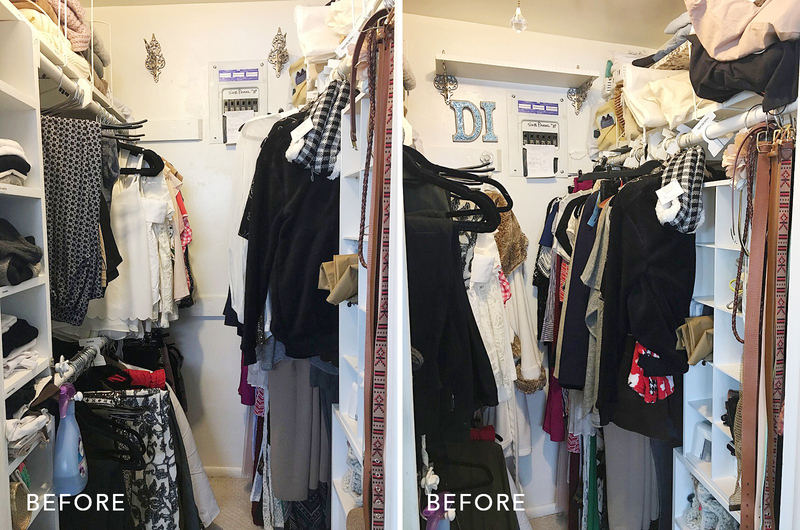 In the end, I’m really thrilled with the way my closet turned out! Big thanks to my friend Danielle who helped me and answered all my freak out texts during this project. It didn’t go smoothly, in fact there were times it went very very wrong, ahhhh. But she helped me through it, and now it’s done! I hope this inspires all of you to utilize the space you have – no matter how small your space, you can make it efficiently beautiful. Just keep everything you love – and donate the rest. I held on to so many clutches and pieces I thought I would one day need and let them go. I am also getting to know my purchasing habits more and more, I wish I could master it and stop wasting money on sale clothes or impulses but I guess it’s still going to take a while, but I’m improving. 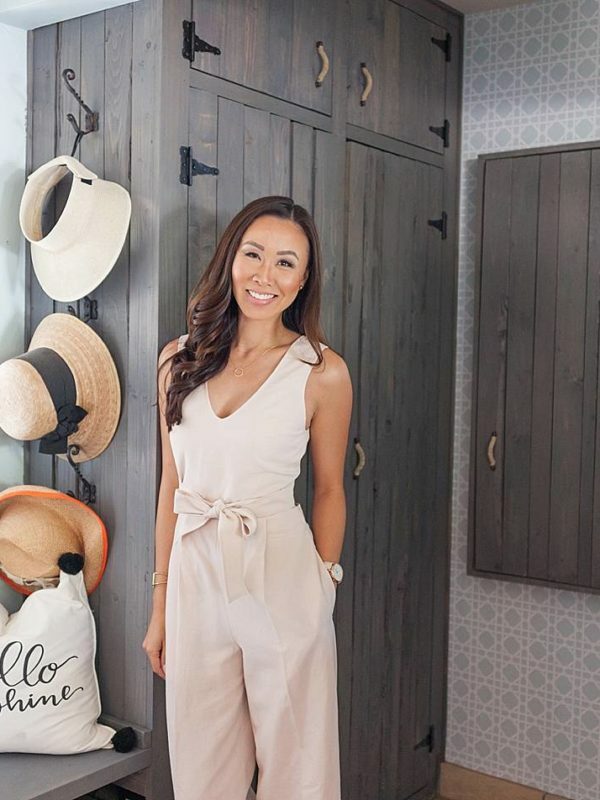 I did a video tour of my closet! What do you think? 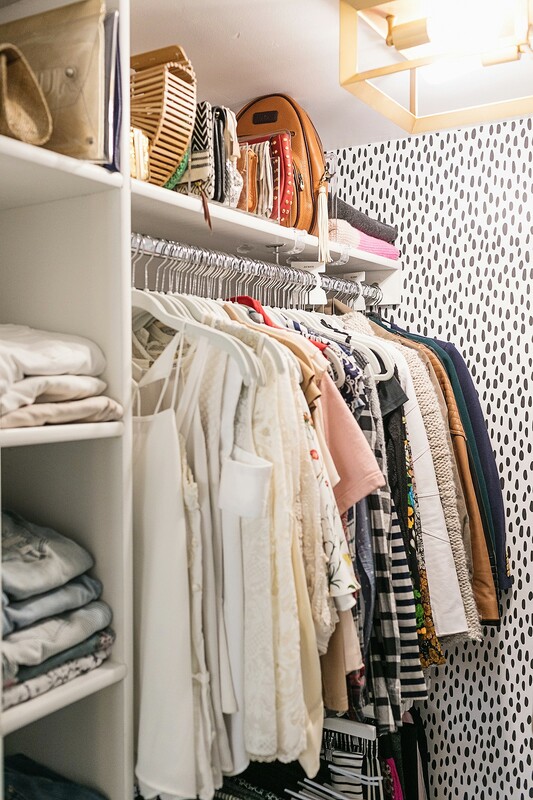 What’s your favorite part of the closet? Tell me in the comments, I’d love to. 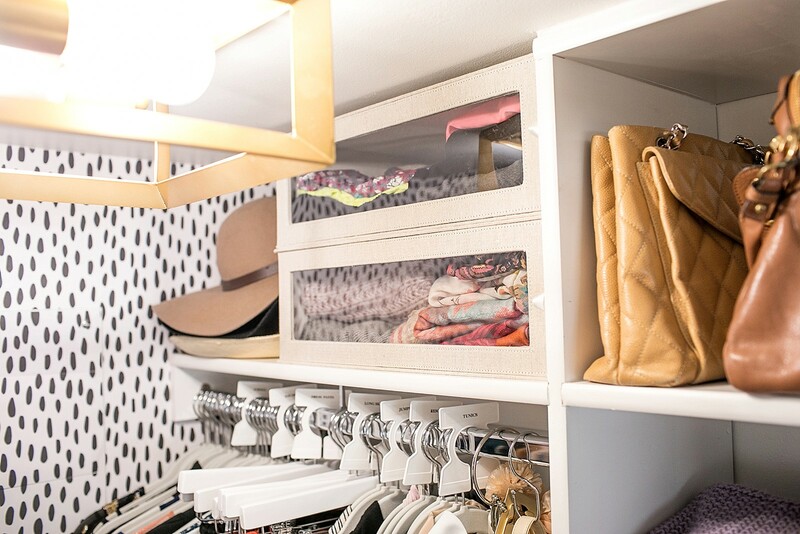 hear and do you have a closet organization tip to share or product you love? Tell me! This looks amazing!! You’ve inspired me to put some flair into my closet. Love the clear dividers and window boxes. Thanks for the inspiration! Thank you!! I hope you do – now you know Danielle so she can help you too ;) xo!! Beautiful! 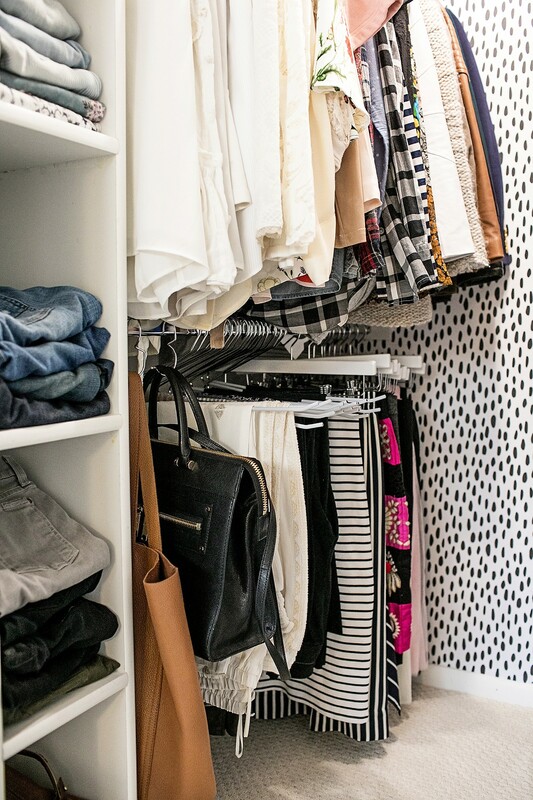 I’m inspired to do the same in my small(ish) closet! It turned out so beautiful! 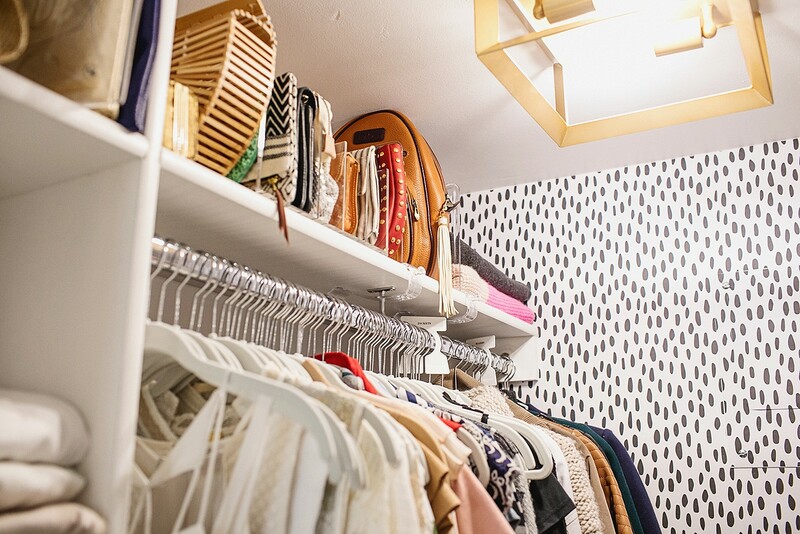 I bet you smile every time you walk into your closet! Thanks – I found it on Pinterest and had to wait for it to get back in stock! It’s perfect!! I love that light fixture and can’t believe it’s under $100! We have some lighting that we need to update and this one is to die for!! I know right??? I found it on Pinterest and had to wait for it come back in stock, so worth it. I look forward to seeing where you put these lights in your home! Great job! Especially like the hiding in plain sight access panel! I swear by Febreze but now that I think of it, haven’t had to buy another bottle in over a yr (might not be using much as I could be LOL). Thanks Don! When you said Febreze I was confused and realized it was in my “before” shot! I rarely use it for my clothes as I’m notorious for washing everything after I wear it once – even PJs, but use it more for Benjamin when he smokes a cigar or the couch if he sits on it after one! I would probably use the wrinkle release spray more! Hi Diana! I love your new closet. The wallpaper may be my favorite part and I like how it conceals the electrical box, which, by the way, I think was purposefully installed away from where it could be hidden by clothes as a safety precaution. I think on rare occasion those things can spark and if clothes were right in front of it…well, you get the idea. I was reading your replies to comments above and found another thing we have in common: I barely wear things more than once between washings. I try to wash on delicate but still, I think my clothes take the beating because of my constant need to wash them. What a dilemma! Hi Diana! I love the lighting fixture. I am considering it for a small nursery. Does it emit sufficient lighting? Thanks! I’m so excited! I’m finally having my closet redone in February and so looking forward to being organized, I hope! lol Yours looks great! Hi, I was wondering if you could share the dimensions of your closet. I am working on expanding a closet I have and want to do two rows for hanging like you have but I am not sure I have enough space. Thanks! 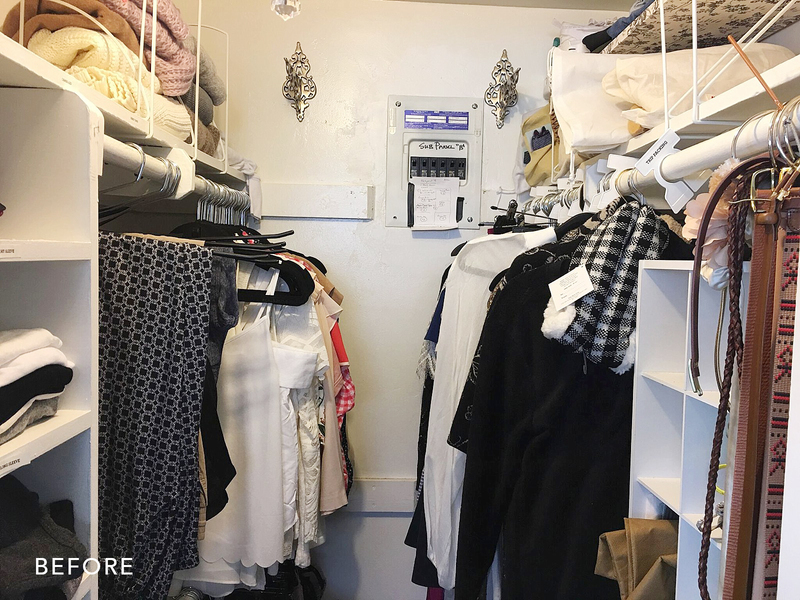 Hi Carol, The closet is 51″ wide and I hang the rods on each side about 9.25″ from the wall so there is enough room with a hanger and any cushion for jackets or sweaters. Hope that helps! Hi Diana, this was an excellent and very thorough article. So very useful. Thank you. I’ll be sure to read the rest of your blog! Hi Sara, thanks for being here and reading! I love this. Even though you went over your budget, every cent was worth it. Aw thanks Dizzy!! The office closet is next this week!! 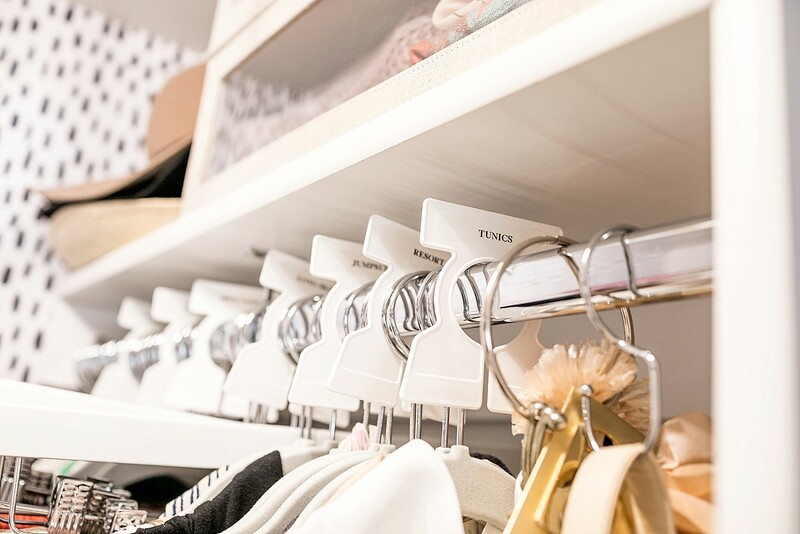 The garment organizers are a great way to organize your clothes! These are really helpful when you have many clothes that are the same color and you don’t have a lot of time to look through your clothing for a particular piece. Thank you for sharing! Beautifully!!! Please wait, how much this dressing room has a width.